Another tale from the underbelly of the book world sees the light of day. On Monday, November 19, at 4pm, French auction house Artcurial will be hosting a sale of science material being dispersed from Aristophil, a fund ostensibly founded in 1990 by French insurance salesman-turned-manuscript dealer Gérard Lhéritier to invest in rare books and manuscripts. Aristophil closed shop in 2014 after authorities discovered evidence that Lhéritier was running a Ponzi scheme that fleeced 18,000 investors of roughly one billion dollars. (Esquire ran this fascinating in-depth piece on the man, his career, and how the plan unraveled.) Lhéritier was indicted for fraud and money laundering, among other charges, and awaits a court date. Now the treasures of Aristophil are being auctioned off. Next week’s sale is the thirteenth of the Aristophil archives (apparantly, worries that these items are co-owned by investors in a hedge fund are no longer so burdensome), and the first to tackle the fund’s scientific materials. 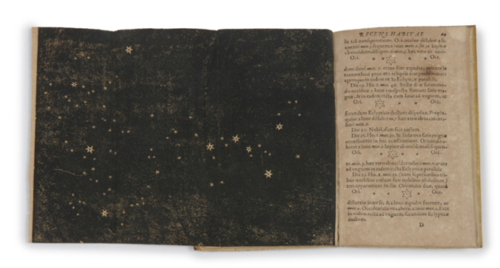 Items on the block are nothing short of breathtaking: a 1610 copy of Galileo’s Sidereus nuncius (est. $18,000 to $30,000), a first edition of Darwin’s Origin of the Species (est. $15,000 to $28,000), and even mathematician Charles de Bovelles’ 1510 Géométrie en francoys, of which only three other copies of this edition are known to exist, with pre-sale estimates ranging upwards of $55,000. Marie Curie, Albert Einstein, Emilie du Châtelet, René Descartes, the A-listers of the scientific community are all well represented here and will no doubt make for an interesting auction. See the whole science catalogue here. Image: Sidereus nuncius, by Galileo Galelei, 1610. Reproduced with permission of Artcurial.